Wild: Dunkleostus Loricaruptor is a very strange creature. It is a fairly large fish, covered head to tail in armored plates, with incredibly powerful jaws. It tends to eat the islands’ water-dwelling crustaceans, as it not fast enough to catch most of the smaller fish. Domesticated: Dunkleosteus is an incredibly useful fish for coastal communities. Its powerful jaws make short work of the stone and oil formations found throughout the oceanic depths. While harvesting, Dunkleosteus can handily defend its rider from all but the largest threats in the waters. And once past its prime, the Dunkleosteus can be harvested for a fair amount of Chitin. 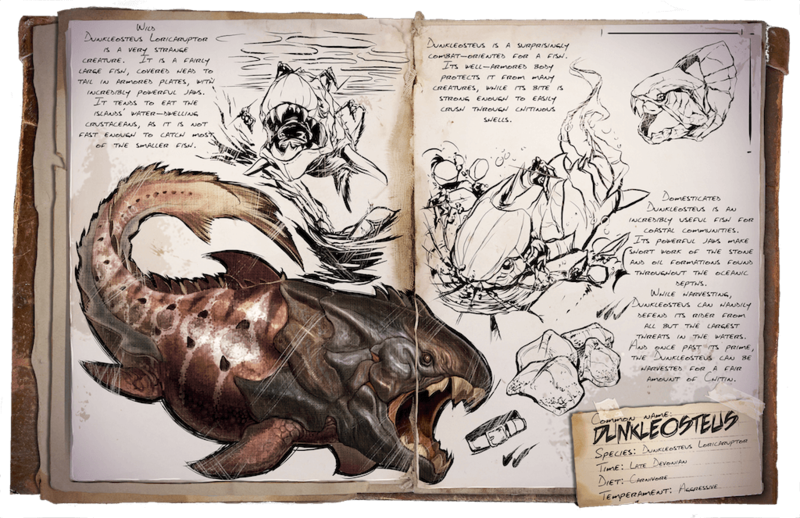 Known Information: Dunkleosteus is a surprisingly combat-oriented for a fish. Its well-armored body protects it from many creatures, while its bite is strong enough to easily crush through chitinous shells.